Please help TWITA welcome guest reviewer, Kymbo. An avid reader, Kymbo is also the teenaged daughter of our own Ang. After reading the first two books in this series, I was beyond excited to receive Shades of Doon as an ARC in the mail. However, I am sad to say I was disappointed as I started reading the book and even had to put it down for a while before picking it up again. 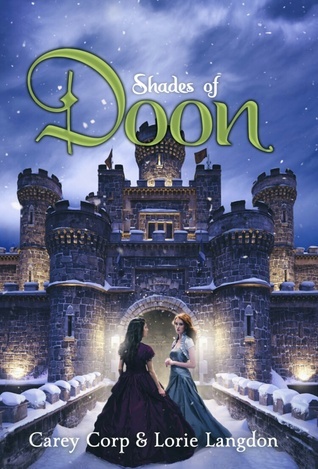 Shades of Doon picks up beautifully from where the second one, Destined For Doon, leaves off; however, as the book goes on it feels as though the authors weren’t sure where they were going with it. I often found myself thinking that I was simply re-reading the second book. I also found myself annoyed with the turn the book took in its age range. I felt like it went from a Teen/ YA book to something intended for pre-teens. Maybe the authors did that intentionally to expand the group of readers for the series, but I found it annoying and even frustrating. The book is marked as young adult, and at times I would agree, but at others I felt more like I was reading a book meant for preteens. The character’s voices changed so much, the language used became immature in places and topics it would dive into and then quickly avoid was annoying, and left a variety of issues unresolved. This felt out of character based on the previous two novels. Regardless of why this happened, I’m sad to say by the end of this novel, I was not excited for the fourth and final in the series.